Classic crisp biscuits in the shape of cute Easter bunnies, spring chicks and dainty Easter eggs. 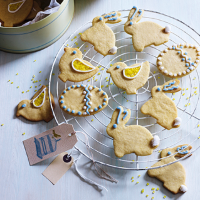 These Easter biscuits are a joy to bake and would make great little gifts. 1. Preheat the oven to 180ºC, gas mark 4. Beat together the Stork and both sugars until creamy, then mix in the egg. Add the spice and flour and mix to make a firm dough. 2. Roll out the dough on a lightly floured surface to a thickness of 2–3mm and stamp out biscuits using Easter cookie cutters. Transfer to baking sheets that have been lined with non-stick parchment and bake for 8–10 minutes until pale golden. Leave to cool on the tray for 1–2 minutes, then transfer to a wire rack and leave to cool completely. 3. Decorate the biscuits with coloured icing and dust with a few sprinkles. Leave to set, then store in an airtight container until ready to eat.